Around 40 percent of all employees in Germany work in an office. Often, however, office buildings do not meet the needs of modern workplace requirements which results in sensory overload, distraction and stress. International studies have shown that office workers perceive subpar acoustics as particularly distracting. On board this year’s MS Wissenschaft, Fraunhofer researchers demonstrate how these performance-degrading influences can be minimized. The magic words: sound masking. It has long been scientifically proven that the way rooms and workspaces are organized has a significant impact on health, well-being and performance – and yet many of Germany’s approximately 17 million office workstations are ill-equipped for the demands of the modern workplace, despite meeting current standards. As a rule, standards guarantee only a minimum level of quality. When people in offices are asked about their satisfaction with various aspects of their work environment, acoustic conditions top the list of complaints. Distractions or interruptions in work due to colleagues’ conversations or low-level background noise are among the causes of increasing psychological stress in the office. The consequences are dissatisfaction, more mistakes and poorer quality of work, increased sick leave and greater employee turnover. “The parameters currently applied, as specified in guidelines and standards for acoustic conditioning of office spaces, do not guarantee sufficient and discernably good acoustic quality,” says Noemi Martin, a scientist at the Fraunhofer Institute for Building Physics IBP in Stuttgart. Disruptive influences in offices call for creative and innovative solutions. Martin and her colleagues at Fraunhofer IBP thus developed sound masking, a technology that improves the acoustic environment by systematically overlaying bothersome background speech with neutral sound signals (white noise). 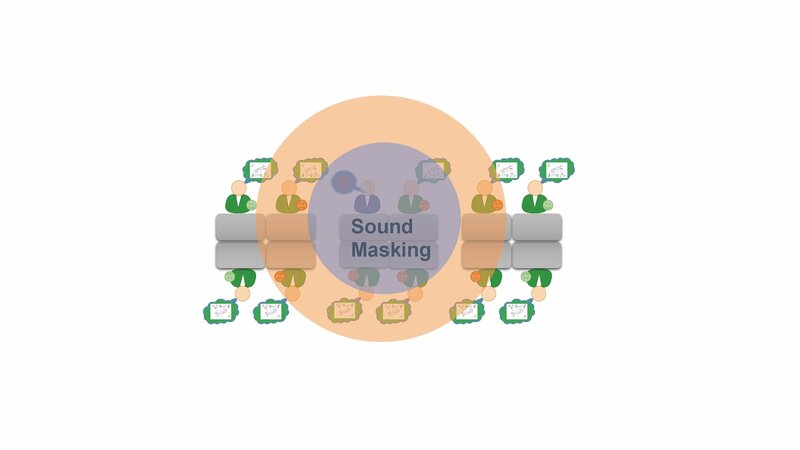 Sound masking is aimed at reducing the perceived disruptions caused by irrelevant background speech, boosting performance and increasing employees’ sense of privacy. Particularly in open-plan offices, poor acoustics and close contact lead to frequent interruptions and a significant limitation of privacy. The appropriate systems can be integrated into the architecture or the furniture – in some cases even concealed. “To improve acoustic conditions, sound is added to the environment, which seems counterintuitive to most people. The ambient noise level is systematically raised, covering up colleagues’ conversations by reducing the intelligibility of speech,” says Martin, explaining the basic principle of sound masking. The scientists at Fraunhofer IBP created a test lab to enable comprehensive impact research. In the lab, the relationship between negative influencing factors in the work environment and a decrease in well-being in terms of both health and performance is investigated. This relationship applies not only to offices, but also to similar rooms in educational institutions, hospitals and other buildings. 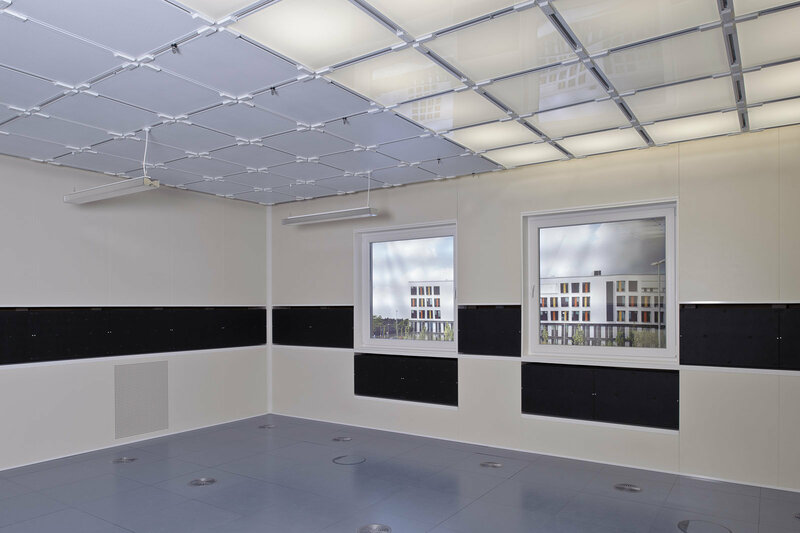 The experts at Fraunhofer IBP use the test lab to investigate innovative solutions such as sound masking. “It is important to promote acceptance of the system among employees, for instance by developing pleasant signals and teaching them how to use the technology correctly,” says Martin. Visitors to the MS Wissenschaft 2018 can experience for themselves the connections between acoustic comfort and performance in office and school environments. At the office workstation installed on the ship, the researchers set up a task in the form of a memory test that is sensitive to distractions caused by background speech. Visitors work on the test while, through headphones, various background noises are presented that have different effects on performance during task processing. Visitors receive immediate feedback on their error rate during each noise profile, enabling them to experience the various effects of different soundscapes, as well as the potential of sound masking. Can ‘local acoustic treatment’ reduce speech distraction within open-plan offices?